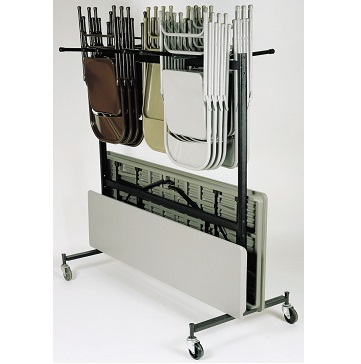 Free shipping to the lower 48 United States for this chair caddy and table cart. This cart allows you to store both chairs and tables, making it ideal for helping you store your banquet products when you have minimal storage space. 67 W x 33 D x 70 Inch H - weight 95 lbs. The table cart portion can fit rectangular tables, including Lifetime branded rectangular banquet tables. 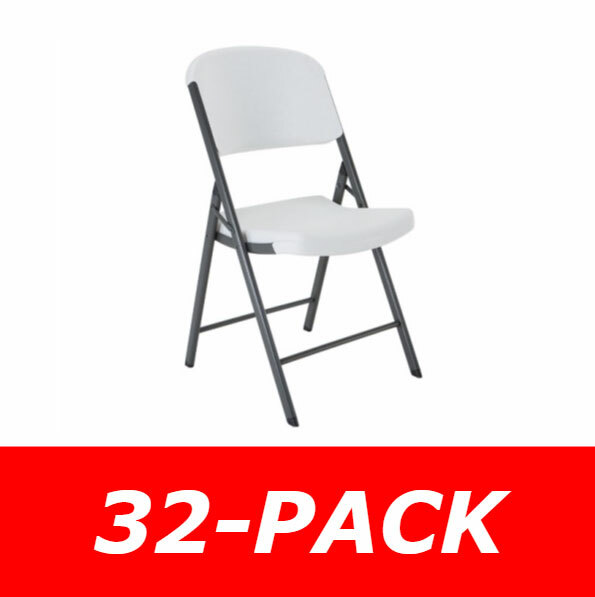 If you are using plastic or oversized plastic chairs such as Lifetime chairs you will need the Extender-8 to extend the height of the chair rack to avoid bumping into the tables. You also need the extender if you are using regular chairs, but tables with a 30" width. This chair and table cart is excellent. The quality of metal materials are the best. The cart was bolted together in only 15 minutes. The four inch rubber wheels glided over our carpet. Thanks for a Great product. Great product. Very easy to assemble. Would recommend checking all parts before accepting from drop-shipper. Two of the casters were damaged and one of the nuts was stripped. Easy fix to get a new nut, but the casters do not rotate very well. We have used this product a couple of weeks now and it is shown to be very easy to use and move around on a hard surface. I would like to see locks added in the future to those wheels, it moves around while loading and unloading causing the cart to move and a table fell off onto one of the people helping to set up. we have plastic tables so no one was hurt. If wood tables are used it may be an issue. We now have a third person holding onto the cart as we unload . Q: Does this arrive pre assembled? A: It does not come assembled, but assembly only takes a few minutes. Fast Shipping: Orders for the 42-8 Hanging Chair and Table Caddy Combo generally leave the warehouse the next business day. Delivery Details: This product ships directly from the factory in Clifton, NJ. Delivery of this product is via a curbside delivery through an LTL carrier (too big for UPS and FedEx). The customer must be present to sign for the order. The freight carrier is instructed to contact you prior to delivery to set up a delivery appointment. Dimensions: 70" x 66" x 10"